How do I tell if I’m done with my work? Your webtext has three progress indicators. First, there’s one at the top of each page that tells you what you’ve completed on only that page. Second, there’s the Table of Contents, which provides an overview of your progress on each page of the chapter. A solid gray square means that every question has been answered. A half-filled square means that the page is only partially complete. An empty black square means that no work on the page has been completed. 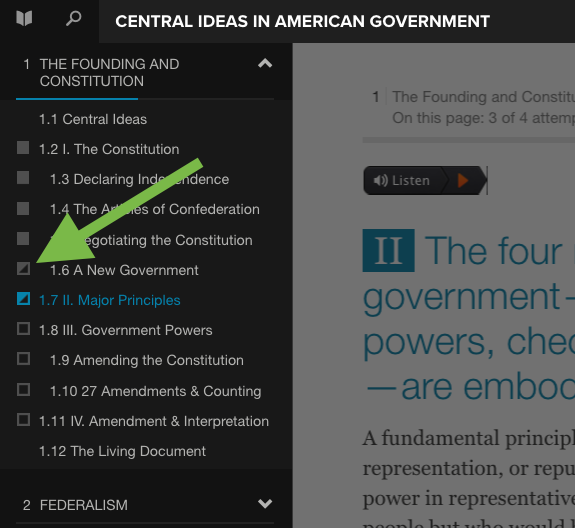 Click the Table of Contents button (the book icon) in the upper left corner to open and close the Table of Contents. Finally, there’s the Notebook, which gives you a more detailed overview and provides page-by-page information. Click the Tools button in the upper right corner, and then click Notebook. Hover your mouse over the orange squares to see more information, such as how many questions were answered correctly. Click on each square for more details. Consult your syllabus or ask your instructor to find out which materials in the webtext are assigned for credit. Contact us if your webtext points look different than you expected, and we can walk you through it.